Audio only baby monitors are the most cost effective way to setup your nursery when you first transition your little one into the crib. With no video monitor, the design is very simple and user friendly. From the manufacturer's point of view there is only really one thing they have to deliver on - great sound! Digital technology has removed a lot of the static, and feedback that plagued the older analogue baby monitors. This allows for a much more pleasant audio experience where the only sounds that may catch your attention are from your baby - not annoying clicks and pops that could keep you up at night. In this post we will compare the audio performance of a range of baby monitors that only offer sound in their functionality. Given that crying is a baby's primary form of communication you almost always be guided by their sound to know if anything is wrong, or not. If you were to jump up every time your baby rolled around unsettled you would be up for a long night! So you are not losing much by relying on this alone before you spring into action. Over time you will learn the subtle differences in your baby's cry, and what it means. Cries of hunger, movement in the crib, or an unusual sound that could signal danger will all illicit a different response from you. Without decent sound quality it would all just sound like the same crackly noise. Clarity in the sound can also guide you for the urgency of the problem. Being glued to the same place while your little one is napping is no fun. It can also be quite irritating if you have chores you would like to do. Finding a monitor with a long range can give you more freedom to get around the house while keeping a strong connection with your baby’s monitor. Probably worse than losing connection is having your monitor’s battery die when you are ready to use it. A quick charging time and long battery life will save you headache and ensure that your monitor is ready to use when you need it. While the chances of your Baby Monitor being hacked are slim, it does happen. If someone was to tap into the frequency there are limitations to what someone can do with audio only. It can be a disturbing annoyance, but far less likely to place your family in any danger. Where video can be viewed it is easier for someone to monitor how people move around the house, and if you are home at all. 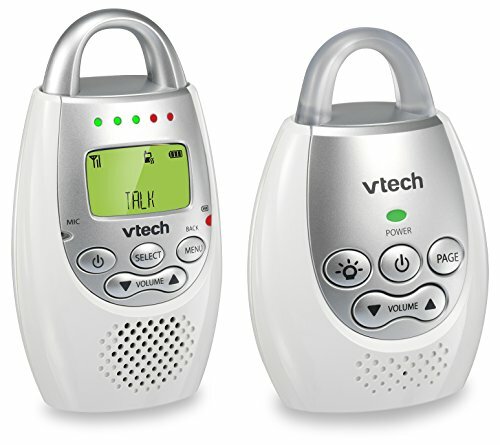 Completely digital, this baby monitor from VTech gives you peace of mind knowing that you will have clear sound and a safe connection to your baby. The DECT 6.0 (digital enhanced cordless telecommunications) allows for crystal clear sound with encryption, letting you feel safe and secure using these monitors. You can also speak into the parent unit so your baby can hear the soothing sound of your voice. If you need some peace and quiet you can mute the monitor, and still be alerted to any spikes in noise by the visual indicator on the parent unit. Come in handy if you need to jump on the phone, or have another little one sleeping close to the monitor. A handy extra is the included night light built into the handle of the baby unit. Convenient and a adds a very soft glow to the room. With up to 18 hours of battery charge you have more than a night's sleep worth of buffer if the power were to be cut. The only negative we found was the beeping noise the unit makes when the volume or sensitivity is adjusted, or when the unit is turned on or off. This was rather loud and was a nuisance. The Angelcare comes in a cool spacey looking design, that is very compact and includes a few nice little extras in the functionality. Having a temperature sensor in the room allows you to make sure you keep the room at that optimum point to promote sleep. This helps remove at least one of the variables you are up against! 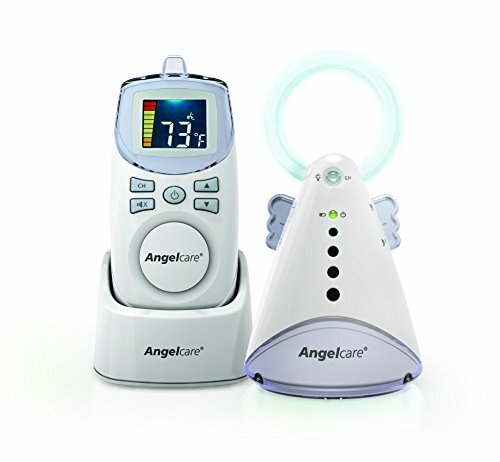 The halo on the baby unit can be used as a built in night light, and provides a nice glow similar to the DM221. This monitor is not digital, which can interfere with sound quality and potentially the security of the monitor. It also turns itself off when things are quiet to conserve power. Springing back to life when there is noise in the room. The only problem with this is that if the microphone is not close to your baby it may not pick up on some lower level noises and movement in the room. A trusted brand for over 30 years, Philips Avent offers crystal clear connection with this monitor that employs DECT technology to keep you and your baby safe. If you would prefer a quieter alert for noise in your baby’s room, you can set the parent unit to vibrate rather than beep. This is great for those that are a lighter sleeper and do not need to be shocked into action. You can also mute the parent unit and rely in the sound level indicators that light up as the noise increases. The baby unit comes equipped with the ability to play lullabies for your little one to help her sleep. A useful convenience! You can adjust the sensitivity level on the baby unit and the volume on the parent unit, but it can still be hard to hear your baby’s cry at times. 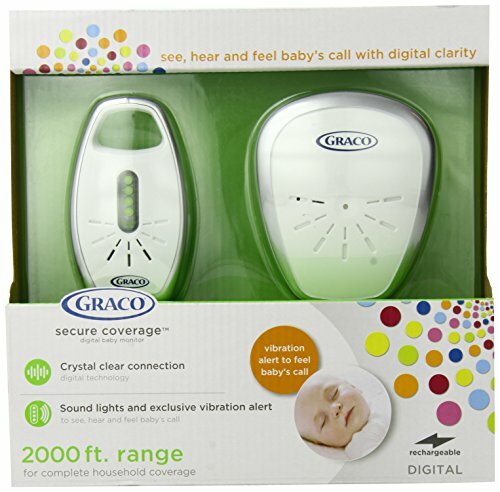 This digital monitor by Graco is 100% digital, eliminating interference from other devices and delivering clear sound so you can hear your baby when she calls. With its 2000-foot range, you have room to roam around your house without worrying about losing connection with your baby’s unit. You can also attach the parent unit to your belt with a neat clip if you are on the move around the house. 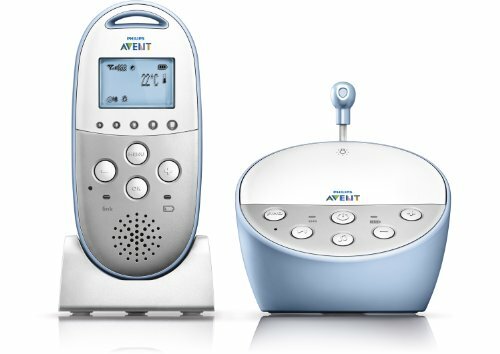 The lighted sound indicators on the parent unit even light up if the sound is turned off, so you can still be in tune with your baby while enjoying some peace and quiet. You can also activate vibration mode on this model. Compared to other audio-only units that have additional features, this monitor seems to be a bit on the more expensive side of the scale. 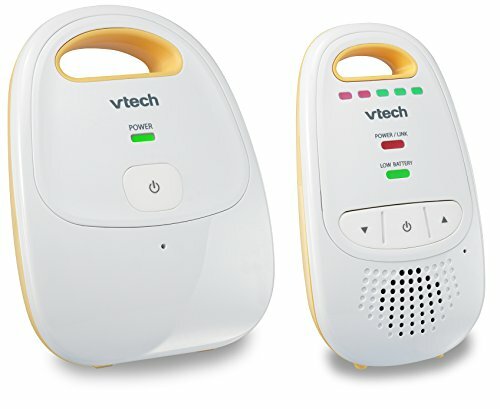 If you are looking for a monitor to simply listen to your baby without all the extra features found in more expensive monitors, this product by VTech is a great option. This monitor is the cheapest of the products we have reviewed, making a great choice if you are just looking for a basic monitor with no additional bells and whistles. The digital technology of this monitor allows for you to hear your baby’s cries, and only her cries, without excess static or rustling. With a long range of up to 1,000ft, and a belt clip on the parent unit included. You can move around the house as much as you like and keep it hands free. However, the baby unit must remain plugged in to the AC outlet. Only the parent unit can run on either on AC power or regular batteries. There is no option for rechargeable batteries. The audio only baby monitor is becoming obsolete from a technology point of view. However, it will retain a place in the market to accommodate those with additional concern for security, and those on a budget. There are limitations with audio only if you have multiple children. Being able to decipher which room to run to can be tricky, and it can be a waste of money setting up multiple monitors. First time parents may also prefer that additional oversight that video provides. But the audio only baby monitor is functional and practical. It wasn't that long ago it was at the cutting edge, and people got by.